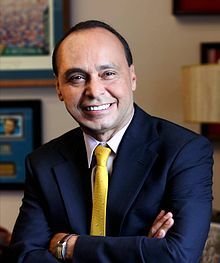 “I would like the Republican Party to meet America’s Latinos. It’s hard to meet us all at once, because there are more than 53 million of us, but let me tell you a little bit about who we are and what we do. Most Latinos are citizens. In fact, many of us have been here for many generations. We live all over the United States, and our population is growing fast. In fact, every single year, 500,000 young Latino citizens turn 18 and become eligible to vote. Of Latinos under the age of 18 — Ninety-three percent are citizens. In this election, 1 in 10 voters were Latinos. In another decade, some analysts predict, we will be 25% of the voting age population. And here’s a key fact about the more than 16 million Latino immigrants — – they work, and they work hard, often in jobs that are hardest to fill. Picking grapes and garlic, caring for young children in day-care centers, sweeping and cleaning as janitors in hospitals and office buildings. You know what else they do? They pay taxes, regardless of their legal status. Here’s one last fact – Latinos love America. And, my Republican friends – I promise, in time, you’ll love us too. I hope this introduction is helpful – but I know it’s a little late. The Republican Party really met Latinos on Election Day. At about 11 p.m., when the race was over, pundits, political strategists, and Republican candidates opened their eyes to discover who really lives and votes in the U.S. It looked like we were watching Columbus stumble across America. Latino voters? Who knew? Demographic changes move as slowly as glaciers, but this one seemed to sneak up on the news media like a sudden thunder-storm. I’ve been trying to introduce my colleagues in the Republican Party to real Latinos and immigrants for some time. I’ve worked on bipartisan comprehensive immigration reform bills and stayed at the table to work out a compromise even when all the Republicans left the table. But the Republican Party seemed much more interested in the imaginary Latinos they tried to use as a wedge issue. So they crafted messages aimed at the very few Americans who are not offended when Republicans talk about criminals, gang-bangers, freeloaders, and law-breakers whenever they talk about Latinos and immigrants. The party nominated a Presidential candidate who carried around a to-do list of creative ways to offend Latinos. Call for more than 10 million people and their families to “self-deport?” Check. Celebrate the extreme Arizona approach to immigration laws? Check. Threaten to veto the DREAM Act and let hundreds of thousands of young people who have applied for Deferred Action fear for their future? Check. Stand with other Republicans and beg for their endorsement when they have called for electrified fencing to keep out immigrants because, quote “that works on livestock”? Check, check and check. I believe Election Day was check-mate for the Republican Party’s extreme, unfair and intolerant anti-immigrant policies. Now, we need to come together to make progress. In truth, some Democrats have not seen how the electorate in this country has changed either. Too many Democrats did not see immigration reform as an urgent priority or recognize the need for change in a country that deports 1,000 immigrants a day. We need to set aside the mistakes of both parties, and do what is right for the American people, including Latinos and immigrants. We need to invite Democrats and Republicans to sit at a big table to work out immigration reform as soon as possible. I have suggested that President Obama set up that big table at Camp David and invite leaders from both parties to discuss how we forge the coalition to pass immigration reform. I think after the Election Day wake-up call, there are more and more Republicans willing to come to the table to negotiate. We have heard from Republican leaders who want to be at that table. I know some Republicans want to come to the table because they want the immigration issue off the table. They want it off the table because they are worried about Democrats running the table in statewide and national elections for the foreseeable future.